How many studies do you suppose that we need before doctors realize that their tendency to want to transfuse blood in every manner of patient admitted to the hospital is nothing more than an exercise in stupidity futility based on the normalization heuristic? It's a compelling logic and an irresistible practice, I know. The hemoglobin level is low, that can't be good for the heart, circulation, perfusion, oxygen delivery, you name it. If we just give a transfusion or two, everything will be all better. I can hear family members on their mobile phones reassuring other loved ones that the doctors are acting with great prudence and diligence taking care of Mr. Jones, having perspicaciously measured his hemoglobin (as by routine, for a hospital charge of ~$300/day - the leviathan bill and the confused, incredulous faces come months later - "why does it cost so much? 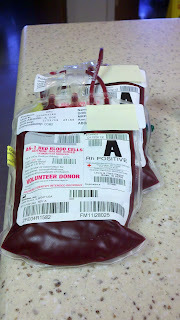 "), discovered that perilous anemia, and ordered two units of life-saving blood to be transfused. It's so simple but so miraculous! Thank God for the Red Cross! Not to mention the cost. My time honored estimate of the cost of one unit of PRBCs was about $400. It may indeed be three times higher. That's right, $1200 per unit transfused, and for reasons of parity or some other nonsense, in clinical practice they're usually transfused in "twos". Yep, $2400 a pair. (Even though Samaritans donate for free, the cost of processing, testing, storage, transportation, etc. drive up the price.) What value do we get for this expense? In this article in the December 14, 2011 NEJM, Carson et al report the results of a trial of transfusion thresholds in elderly patients with cardiovascular disease and risk factors undergoing surgery for hip fracture. There are several delightful features of this article. Firstly, the authors targeted a group of patients in which it is, in practice, truly difficult to resist the urge to transfuse. Partly because it's surgeons treating them, partly because they're elderly and thought to be less tolerant of anemia, partly because of what is probably a misguided logic surrounding cardiovascular disease and anemia ("The heart rate is 70 - exactly why do you think this paitent needs a transfusion for carviovascular stress? "), this is a group very likely to receive transfusions in the hospital. Secondly, the authors made a composite primary outcome comprised of both mortality and the ability to walk across a room. I really really really like this, because, as I have previously opined in this blog and just this week on the new blog, reducing mortality is an oversimplified goal. Alive and bedridden is not the same as alive and functional, and our clinical trials should be designed to reflect this difference. Alas, this one is. Thirdly, the authors, despite appearing to have been initially motivated by the alternative hypothesis, remain cautiously agnostic about their results including the post-hoc findings, dismissing the gender interaction because it was "not anticipated and could have been due to chance." That's nothing less than outstanding. Apologists and those unwilling to be swayed by their own data would have waxed prolific about the reasons men and women may differ and proposed different transfusion thresholds in men and women or at least a trial investigating this post hoc result. Carson et al call them like they see them: chance findings not worthy of our time. The bottom line is that, in yet another large group of patients, we get precious little value from transfusion - save for normalized laboratory values and satisfied doctors, family members, and Samaritans who believe that their donation is saving lives. In case we need more evidence that increasing hemoglobin levels is useless, we can look to the erythropoetin studies, which show that stimulating endogenous erythropoesis for higher hemoglobin targets is as useless as transfusions of red cells as discussed in this blog post. My main worry going forward is that there will be continued resistance to the notion that anemia is an epiphenomenon of other illnesses and not itself directly harmful and that more and more populations of patients will be subjected to transfusions and trials just to make sure that the transfusion hypothesis is a failure in those populations too. This approach will waste valuable and scarce research resources and forestall the due atrophy of the wasteful and profligate transfusion apparatus that secures donations of 17 million units of blood annually and transfuses 15 million of them into patients. For my own part, working as a full-time, hospital based intensivist, I could probably get along all year with an allotment of 12 units of blood for non-acutely bleeding patients, so infrequently do I transfuse patients with anemia. (I do drastically reduce phlebotomy which probably helps a good deal.) Patients certainly don't appear any worse off, and I wager are better off. Not to mention the money we're saving, and the young Samaritans who are now liberated from iron supplements, sub-par marathon performance, and guilt. I think I may become a Jehovah's Witness. As regards to transfusions during acute GI hemorrhage, a Cochrane Review was recently published: http://www.ncbi.nlm.nih.gov/pubmed/20824851. Perhaps it's time for a trial of transfusion for acute hemorrhage too.